Oh, to be four years old again when the only thing I had to worry about was the injustice of being sent to bed when it was still light outside. Those were the days when I truly believed the tooth fairy replaced the tooth under my pillow with a quarter, I thought that my doll's hair would grow back after I cut it, my little brother existed for my own dressing up and hair-playing-with amusement, and there was no one I'd rather spend every waking minute with than my mom. When my sister left me to start kindergarten, I was devastated, but that wasn't nearly as heartbreaking as when I had to leave my mom to head off the kindergarten myself! I was a child who loved being home, and my imagination blossomed with the lack of technology and television to be entertained with. Complaints of I'm bored were usually met with go outside and play! And so we did play, in the woods across the street, riding our bikes around the neighborhood, collecting leaves in the backyard. One of our favorite games was turning my dad's rickety wooden trailer he used for occasionally hauling something into our "fort", with piles of leaves for a bed and a bucket with a plastic cup and string for our water well. 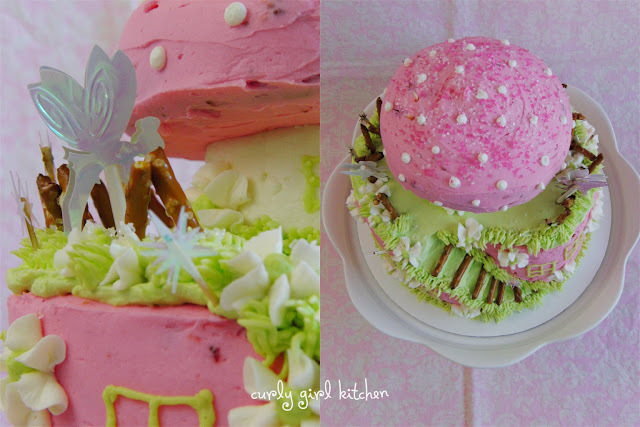 For a friend's daughter's 4th birthday, I was asked if I could make a "fairy" cake. 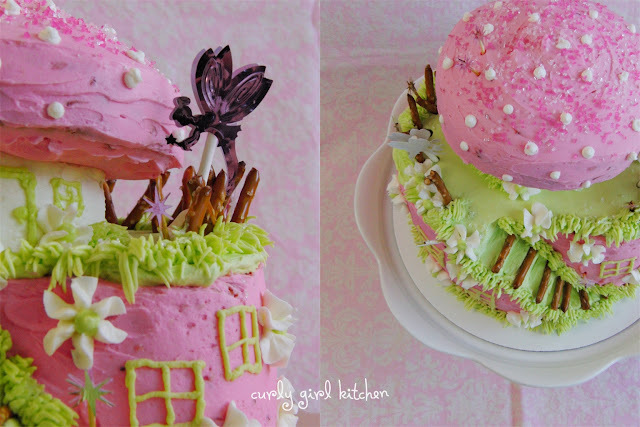 The idea for this cake evolved in my mind over the course of a few weeks, starting with the little confetti fairies you see in the photos. 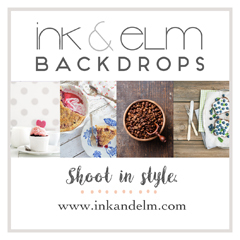 I knew I would be gluing those to lollipop sticks for cake pops, and maybe with a few in the cake itself. 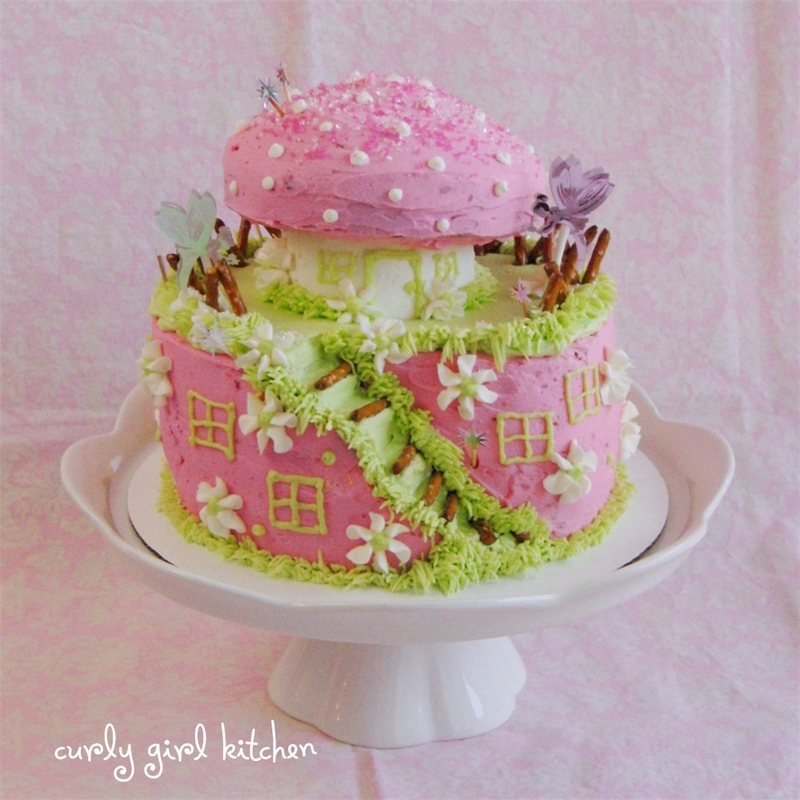 And when I saw the birthday invitation, a flowery field with fairies and a pink mushroom, I knew this cake would need to have a little mushroom house on top. 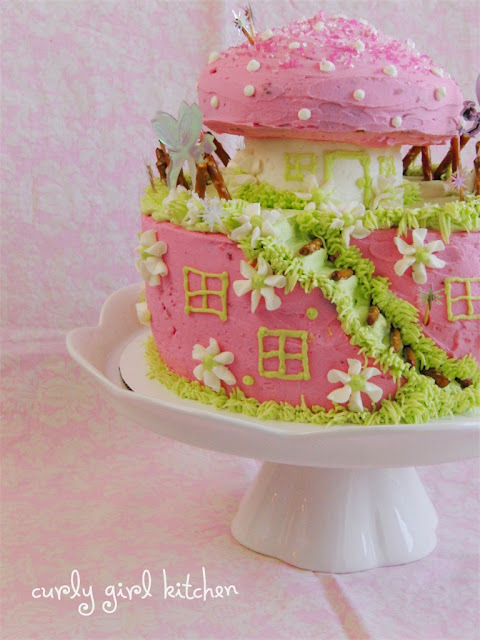 The stairs were probably my favorite feature, and really made the cake extra special. As Jamie and I drove up the street to their house for the party, cake carefully stowed in its carrier at my feet, we spied Tinkerbell walking down the street! She flew down from Never Never Land just to pay a special visit to the birthday girl, Brynn. Bake and cool the cakes completely. Prepare and tint the buttercream. Place one 8-inch cake on a cake board. Top with half the jam. Add the 2nd 8-inch cake. Top with the rest of the jam. Place the 3rd 8-inch cake on top. Take a very sharp knife, and carefully carve the stairs into the side of the cake, starting at the top and working your way down. Frost the sides only with the pink strawberry buttercream. Frost the top of the cake and the stairs with the green buttercream. (To frost the stairs, I carefully piped frosting onto each stair and then smoothed it out with a knife, shaping the stairs with the frosting. Piping the frosting onto the stairs is crucial - if you try to spread it directly on with a knife, you risk tearing the cake and filling the frosting with crumbs. Take one of the 6-inch layers of cake, and using a 4-inch biscuit cutter (or sharp knife) cut it into a 4-inch round. Frost the sides and top of the 4-inch cake with white buttercream (I did this on a plate first, then transferred it to the cake). 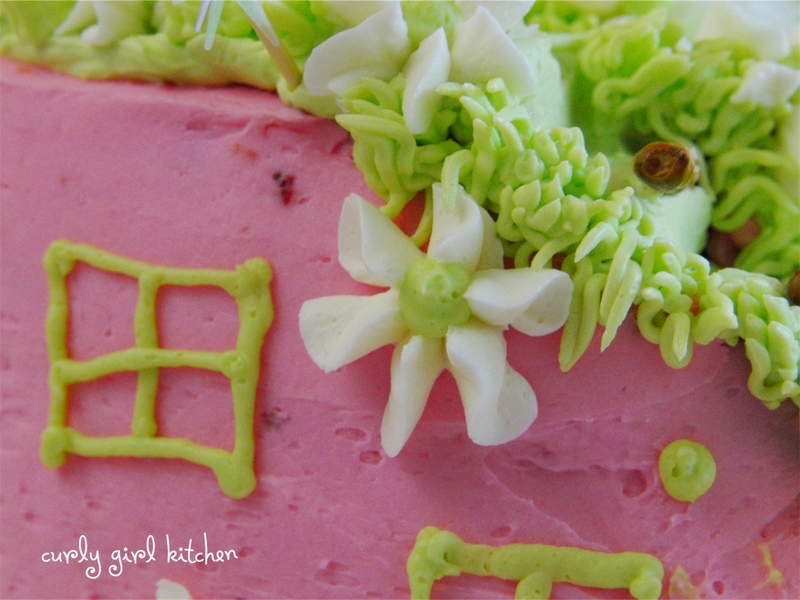 Fill a piping bag fitted with a small round tip with green buttercream. Pipe a door and windows on the side of the 4-inch cake. 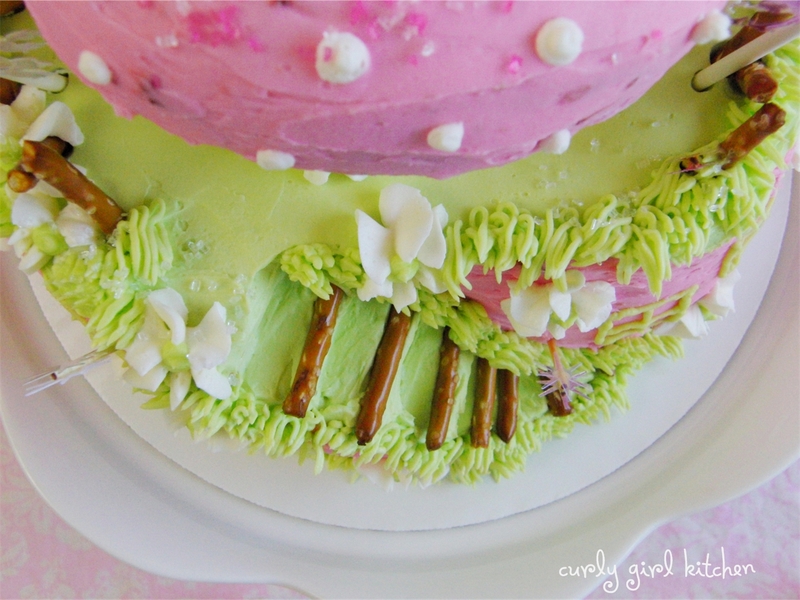 Switch to the grass tip and pipe grass all around the base of the 4-inch cake. 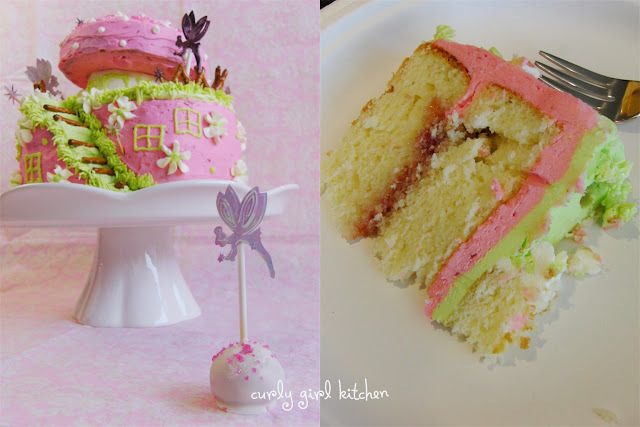 Take the other 6-inch cake and holding it upside down (with the domed top against your palm), spread pink buttercream onto the base of the cake. Turn the cake over with the unfrosted, domed side up, on top of the white base. At this point, secure the whole cake with a wooden skewer straight down the center. Carefully frost the sides and top of the cake with pink buttercream - it should look like a mushroom on top of the cake. 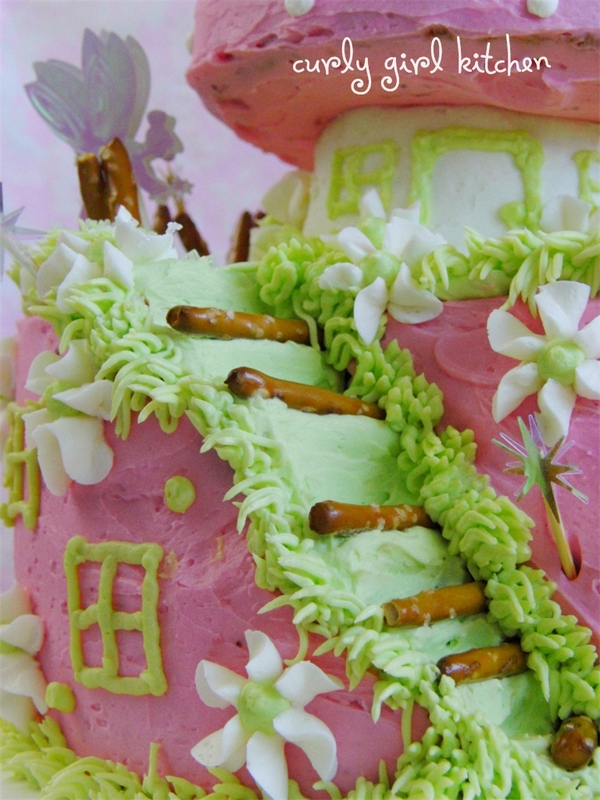 Take the pretzel sticks, and insert them around the edges of the cake, angled back and forth, to look like a rustic fence. Insert a pretzel stick at the edge of each step into the cake. Using the grass tip, pipe grass around the bottom and top edge of the 8-inch cake, and along the steps. Using the drop flower tip, pipe white drop flowers randomly around the cake. With a small round tip, fill the centers of each flower with a green dot. Pipe a few windows randomly around the cake. With a small round tip, pipe white dots onto the mushroom. 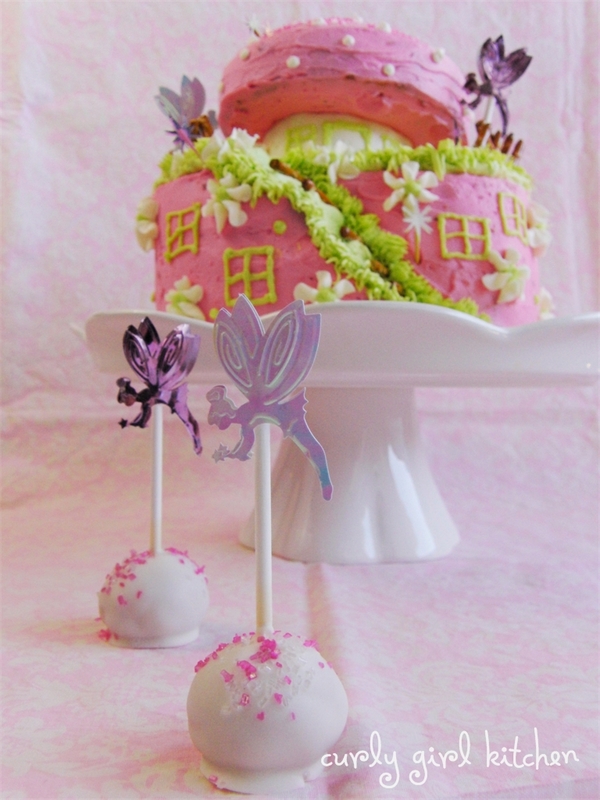 Decorate with confetti fairies and stars glued to lollipop sticks or toothpicks. If transporting via car, refrigerate for several hours to stabilize the cake for transportation.